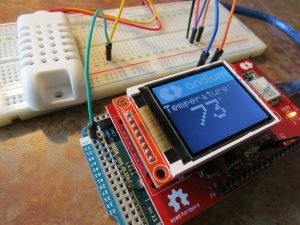 Get connected to Adafruit IO using MQTT! This project explains how to stream DHT22 temp data to Adafruit IO’s dashboard! Have you heard? Adafruit offers this great free tool to visualize your Arduino’s data in the cloud! Not only is it super easy to use, but it’s free! Although Adafruit refers to it’s current release as beta, we’ve had great success pairing it with anduino to create some interesting IoT devices. In this guide we’ll walk you through getting your anduinoWiFi connected to Adafruit IO and displaying sensor readings! In this case we’re going to use the DHT22 temperature sensor. Visualizing your apartment’s temperature data in the cloud could be your first step in creating your own DIY Nest thermostat! In order to upload to the cloud we’re going to need to create an account on Adafruit IO! This way we’ll have the necessary credentials for authenticating our anduino shield to speak to Adafruit’s dashboard. Navigate to Adafruit IO and sign up to join the beta! Once you’re profile is created you’re going to want to jot down a couple important things about your profile. Navigate to settings and then click the button that says, ‘View AIO Key’. A dialog will pop up revealing your AIO Key, copy, paste, keep this in a safe place, we’re going to copy it over to our sketch in a moment. Also take note of your username, it should be displayed at the top of the screen adjacent to the /settings title. Let’s check out the sketch! Clone, download the source, or copy and paste the Arduino sketch below into your IDE. There are a few required libraries we’ll need to make sure you have downloaded and imported into your IDE before moving forward. Publish that reading to our feed. We also update anduino’s LCD display with the latest reading each time around. Note this sensor is also capable of reading humidity! Once you get this working it’ll be fairly straight forward to uncomment some lines of code and create a new feed for your humidity readings as well! Before you jump ahead and flash the sketch don’t forget to fill in your specific WIFI_SSID, WIFI_PASS, your_IO_Username, and your_AIO_key. Read more: Anduino Speaks Adafruit!